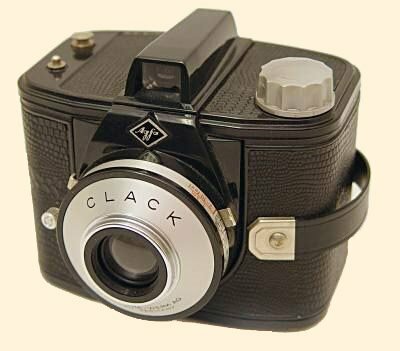 The Online Photographer: At Least It's Not Called "Clunk"
In the ugly sweepstakes, the Agfa Clack gets extra points for having a really good bad name. When will you circle around to pretty cameras? Like the Leica IIb, M4, and SL, Nikon F2 Titan, Rolleiflex 2.8D, Linhof Master Technika 2000, 5x7 Sinar Norma, Ebony SV, and the Arca-Swiss F-Metrics? I think you are being a bit unfair to the Clack. The evolution of the snap shot camera from the Kodak Box Brownie can be seen in this camera. I would imagine that in its day it was quite acceptable. Oddly enough I don't think any of these cameras are all that ugly. Is there something inherently beautiful about cameras, that's almost impossible to screw up? I don't think an ugly camera can ever be as ugly as an ugly car. I got a Clack from I don't know where when I was a kid. It was my first camera. I still have it. I think it's sort of cute. Living in France, i would also note that dropping the "L" in this results in "c*ck", resulting in the French slang for excrement. I wonder if the marketeers at Agfa noticed that?